Tiger Woods has yet again won the Masters Tournament. No, that's not a sentence that time traveled here to confuse you. Woods actually won the 2019 Masters at age 43. However, you'd be forgiven for the time travel confusion. Woods hasn't won a major tournament since 2008, and he hasn't won the Masters since 2005. This year's championship is his fifth, with the first four coming over a span of nine years starting in 1997. Seeing Woods' improbably weekend lead to another green jacket had many people reminiscing about their past selves. It quickly became a thing on social media to point out what you were doing during Woods' last win or what the world was like. It seems almost impossible, but his last Masters win was before the release of the first iPhone. The win was also Woods' 15th major win, which is the second most in PGA history behind the 18 that have been won by Jack Nicklaus. 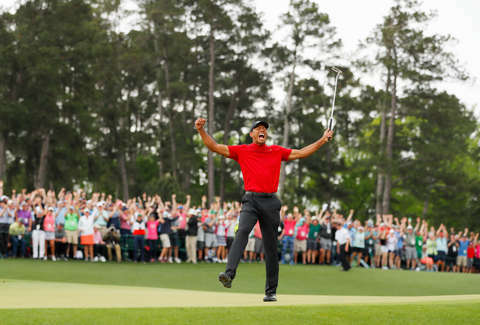 Here's a look at some of the best tweets where people commemorated a historic win for Woods with thoughts about how long it's been. The last time Tiger Woods won a major “The Dark Knight” was the highest grossing film of the year.